A survey of our emerging knowledge of microorganisms, the environments they thrive in, and their implications for human health and sustainability. How did the first life on Earth come to being? How will we solve the crisis of antibiotic resistance? How can we break down the pollution that cripples our planet? According to Anton (English/DePaul Univ. ; The Longevity Seekers: Science, Business, and the Fountain of Youth, 2013, etc. ), the answer is microbes. 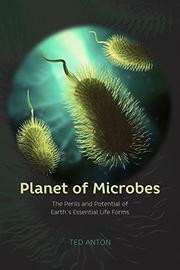 Single-celled organisms were the first living things on the planet, and, as the author details, we now know they go far beyond. Certain archaea, a bacterialike set of microorganisms with some metabolic similarities to higher animals, have been found in meteorites, comets, and at the bottom of the ocean floor. These life forms use alternative chemistries to most modern life because extreme temperatures, lack of water, and the constant bombardment of asteroids made life as we understand it impossible. Anton shines in his detailing of research that has unveiled the reach and weight of microbes and the chemistry and geology of the ancient Earth. But the organizational structure of the book is confusing. The author focuses too much on researchers, at the expense of the science, asking readers to remember far too many names instead of scientific ideas. On a single page, he moves readers from a microorganism on the surface of a comet to the human gut and then back again without clearly outlining how they are scientifically related. Anton continually hints at a comprehensive health discussion that never manifests, and the health-related claims he does make are not as well-researched as his presentation of microbial life outside of the body. A scattered presentation of the expansive topic of microbes and early life on Earth with limited discussion of how humans might effectively leverage that knowledge to solve health and environmental crises.